Versatile Units Incorporate Several Tools in One. Enjoy many of the features of a professional transit: Brunton transits with induction damping combine the principles of a surveyor’s compass, a prismatic compass, clinometer, hand level, and plumb. 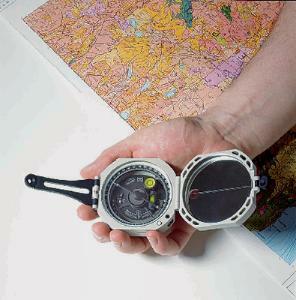 For additional precision, transits can be adjusted for magnetic declination with a simple screw turn on the case. The dial is graduated in 1° increments to obtain closer readings than from standard 2 to 5° graduated models. For life-long utility, units include a lift-pin mechanism to protect parts from accidental impact; rubber O-rings keep out moisture and dirt. The sleek composite plastic housing is as durable as metal but lighter in weight. Ordering information: Supplied with leather case and instruction.